Looking for venue hire, Leicester room hire or a location for your next corporate event? 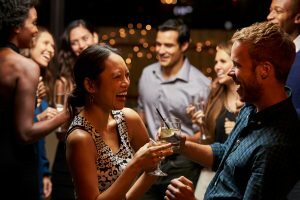 Manhattan34 offers the perfect range of venue hire Leicester options to make any night truly memorable. Our unique heritage building has provided a memorable backdrop for a wide range of private celebrations and corporate events in the past. We have hosted numerous wedding receptions, engagement parties and birthday parties of all sizes in the past. Our years of expertise in party planning and delivery mean that whole venue hire is a great option for large gatherings and gives you the possibility of holding a variety of entertainments throughout the night and around the building. 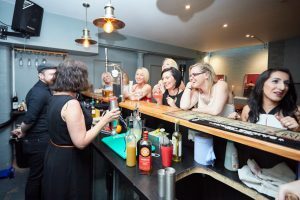 With a maximum capacity of 250 people over two floors along with 2 separate bars your guests will have ample room to relax, be entertained and sample some great cocktails. When planning a whole venue hire we will invite you to the bar for a 1 hour consultation to work through all of your requirements in detail. With our established network of contacts, we can help if there is a specific entertainment you would like that you cannot source yourself. In the past we have provided a table magicians, live music and DJ’s. We can also offer a completely bespoke cocktail menu for you and your guests that suits your occasion, theme or corporate branding. Please contact us for initial diary enquires and for initial quotations. Our Cellar Bar offers an ideal space for a range of functions and occasions from birthdays to baby showers to gigs and much more besides. It offers privacy and a unique ambience, with a fantastic flexibility which allows it to be dressed up or down depending on the nature of your event. The Cellar Bar is fully stocked up at all times and offers a fun Prohibition-era styled cocktail menu. The Cellar Bar comes with its own surround sound system so the music is under your control to suit your preference. We also have a stage if you would prefer live music, and there is ample space for a DJ to set up if you just want to dance the night away. We also offer drink and food packages so please ask us for the latest on offer. There is a maximum capacity of 80 people. The Cellar Bar is free to hire out – we only ask for a security deposit and a bar deposit. We have a great atmosphere at Manhattan34 and you can be a part of the action with our ground floor room hire options. If you’re looking for something a bit more discrete than a whole venue hire, that is suited for smaller groups then this is the option for you. With the hire of these rooms we offer food and drink packages to fit your requirements – both day-time and night-time.